Changing Your Clothes | Shopping, Sewing, Upcycling, Repairing: Make the most of your clothes! Just published in Colette Patterns‘ sewing magazine Seamwork: My latest article on using color palettes in real life! It’s called Color in Your Closet: Discover (and Use) the Palette Within. Using your palette when you shop! This post appeared originally at my A Musing blog, here. 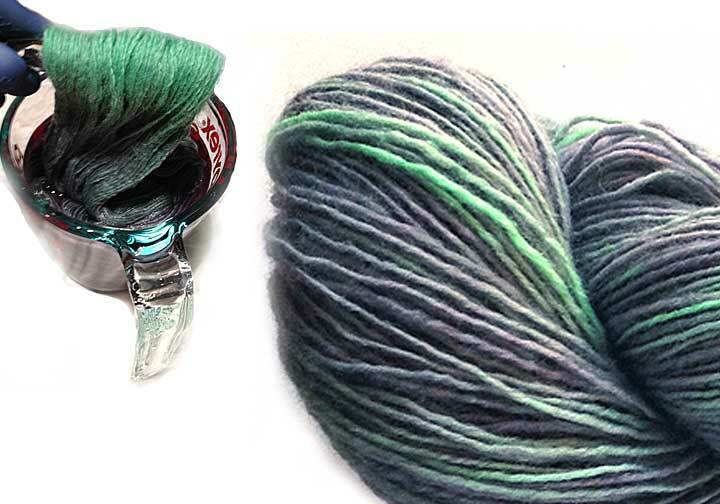 Want to see sewing stuff from Colormusing? Check out myBratelier (lingerie sewing, including bras! ), and A Musing, covering all things color-palette-related. And don’t miss all my newest projects, including sew-alongs, at the brand-new SewColormusing blog! Click on the dots above to visit my mother ship, Colormusing.com, where you can also sign up to receive Hue News, Colormusing’s own monthly e-mail newsletter! Categories: Color Palettes, Inspiration!, Shopping!, Wardrobe Creation | Tags: accessories, closet, clothes, clothing, color, color palette, color palette article, color palette in your wardrobe, colormusing, fabric, fashion, Lindy Thibodaux article on color palettes, palette, sewing, tutorial, using color palettes while shopping, wardrobe, wardrobe planning | Permalink. Categories: Color Palettes, General, Inspiration! | Tags: changing your clothes, clothes, color, color palette, color palette ideas, color tutorial, colormusing, colormusing shop, using color in wardrobes, wardrobe color palette | Permalink. Talk about Changing Your Clothes! It’s interesting that all these looks are from the middle of each decade– I find the biggest fashion changes tend to happen near the ends. I love this video of 100 Years of American fashion in under 2 minutes! I’m curious: When reading through this list, is there one (or more) that immediately strikes a chord before you go to the slideshow? If so, that’s a really good indication of the general direction of your personal style. For me, Editor Off-duty and The New Bohemians sound the most like me, but I think I’ll look at the slideshow before I decide. …a New Bohemian? Or both? While it’s tempting to go for simplicity and claim just one of these categories as your own, keep in mind that it’s almost impossible to sum up your personal style under a single heading. When I first looked through this slideshow, I found myself wishing that I could just say I’m this or I’m that, and be done with it (certainly would simplify shopping! ), but we’re all more complex than that. I really do like putting together outfits that combine modern structure with a slightly quirky side, rather than adopting one look head-to-toe. So, based on this slideshow, I’d call myself Editor Off-duty meets The New Bohemians. To be honest, even saying that makes me want to rebel just a little and say, “But there’s more to me than that! What about gym clothes? What about tango ensembles? ?” This made me go back and look through the list of styles in the slideshow once again, but this time with this goal: Put together an outfit with 1 element from each of the 5 types. What do you think? Can it be done? Personally, I much prefer this kind of mix-and-match approach. By this I mean mixing styles; the only “matching” I really ever do is coordinating colors, and the easiest way I’ve found to do that is by creating color palettes for my outfits. In this outfit, for example, the multicolor bag pulls together the red and blue, with the white shoe and gold ear cuff functioning as neutrals. While it’s certainly possible to dress consistently in just one style, I believe it’s easier to be true to who you are if you give yourself more options; otherwise, there is always the danger of becoming stuck in a style rut (or worse, looking like you’re wearing a costume). The style approach I find the most modern is to start with the general style you feel most comfortable with for your key wardrobe pieces, then add smaller pieces and accessories from a different style perspective. I’m curious (again): What type(s) do you most identify with? Maybe you consider yourself to be in a category not represented in the slideshow. Are you a one-look-head-to-toe kind of person, or do you like to mix it up— or both? *The usual disclaimer: I’m not affiliated in any way with Refinery29; I’m just an e-mail subscriber who really enjoys the fashion headlines/advice/inspiration they send me. Categories: Fashion, General, Wardrobe Creation | Tags: creating a wardrobe color palette, creating outfit, creating wardrobe, fashion styles, finding your fashion style, mixing styles, Refinery29 slideshow | Permalink. Sparkling Diamonds (and other Birthstones) in Color! 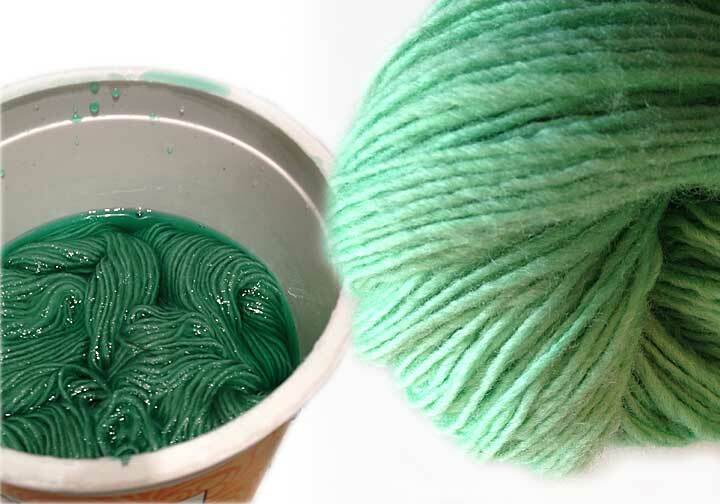 Strictly speaking, this isn’t about clothes, but it is about dyeing, which I’ve already been writing about here (and which applies to some of my changing-clothes posts). 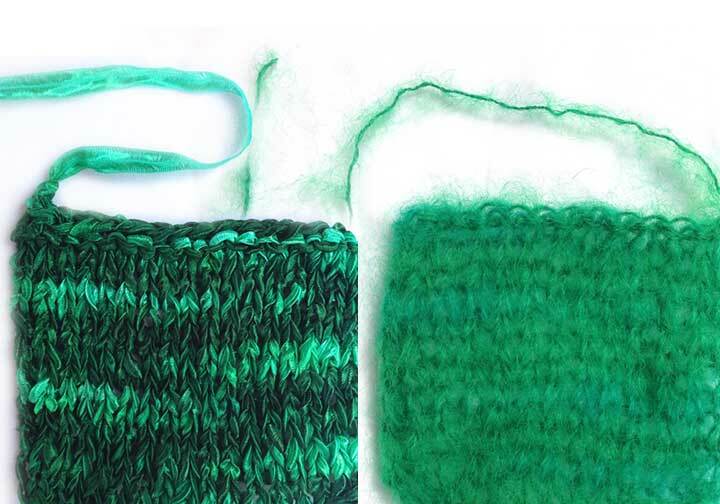 It’s also related to my current book proposal project, focusing primarily on the palette-dye recipe-dyeing yarn process— I’d love to have your feedback! 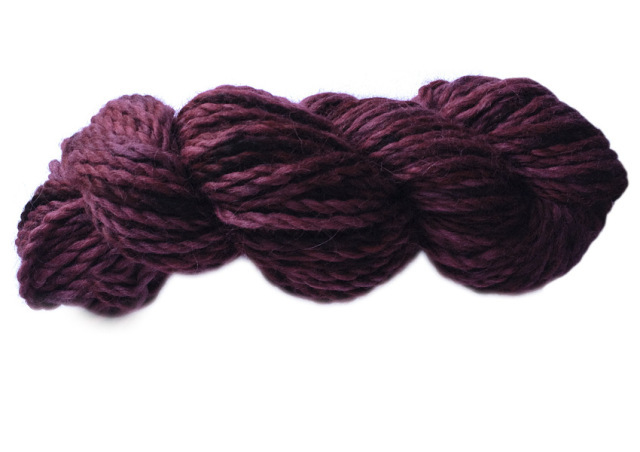 My Garnet hand-painted colorway, shown here in Aussi (100% Australian merino wool). Garnet in Buttery Thick (100% alpaca). Garnet in Ticklish (100% nylon novelty flag yarn). Amethyst in Softy (80% merino wool/20% cashmere). Amethyst in Ticklish (100% nylon). 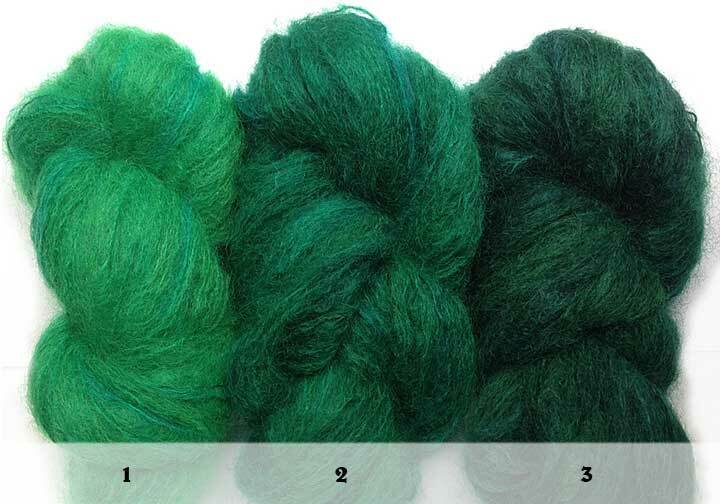 Aquamarine in Ticklish (100% nylon). Aquamarine in Airy (100% alpaca). Said the Palette to the Closet: Color Me Surprised! My closet is just full of surprises. Yes, I know it says it’s about interior design, but if you look, you’ll find that most color palette-oriented materials available do seem to be for interiors. But that doesn’t mean you can’t put them to use in your closet! 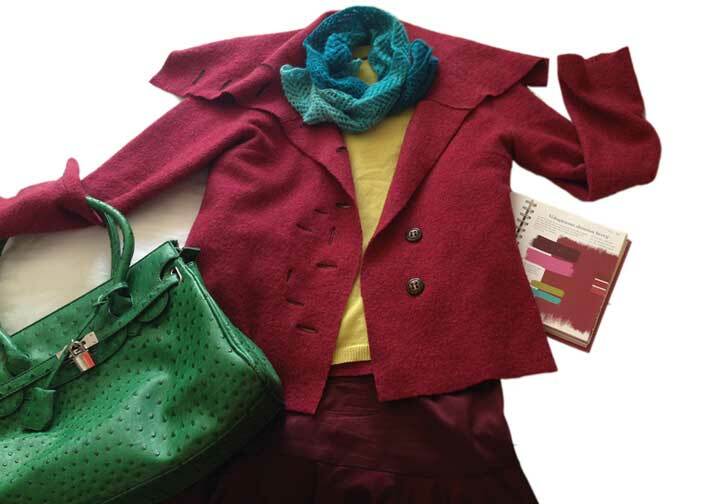 In fact, the following experiment may just inspire you to try new color combinations with the clothes and accessories you already have, not to mention the way you choose new items to add to your current wardrobe. Try it! Step 1: Pick-a-Palette! 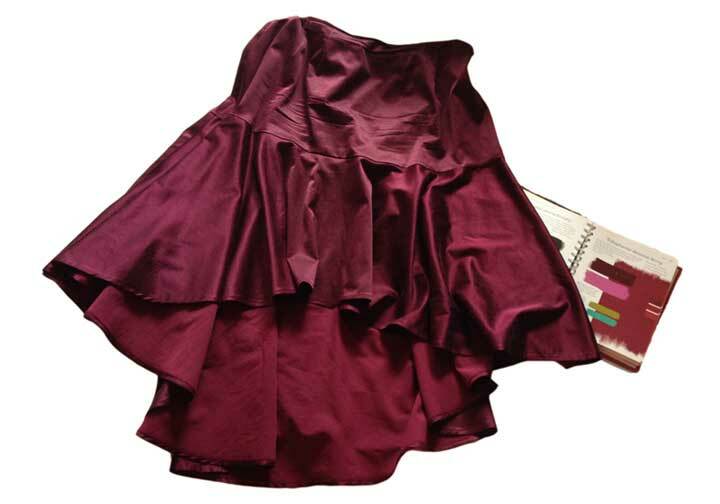 I chose this one primarily because I know I already have several things in my closet in the main color (bordeaux, although they’re calling it damson berry). I love the general idea of wearing several different shades of red together, so this seemed like a good place to start. Tip: Make sure your palette has a minimum of 3 colors: main color, secondary color (often a contrast to the main color), accent color. A simple, high-contrast wardrobe example would be a black skirt (main color), white blouse (secondary color), hot pink heels (accent color). If your palette has more than 3 colors, like the one shown here, you’ll have that many more options, particularly with your accessory colors. 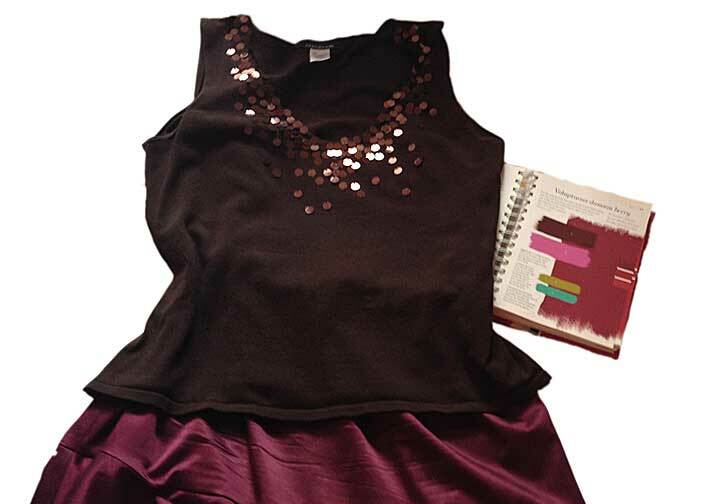 Step 2: Main-color garment: Bordeaux skirt. Step 3: Top that skirt! This is the closest match I could find to the darker secondary color (top left on the book page), which they’re calling “eggplant”. This deep brown looks pretty close to me. Already I have an outfit of pieces that I hadn’t previously thought to combine! Step 4: Add pink! 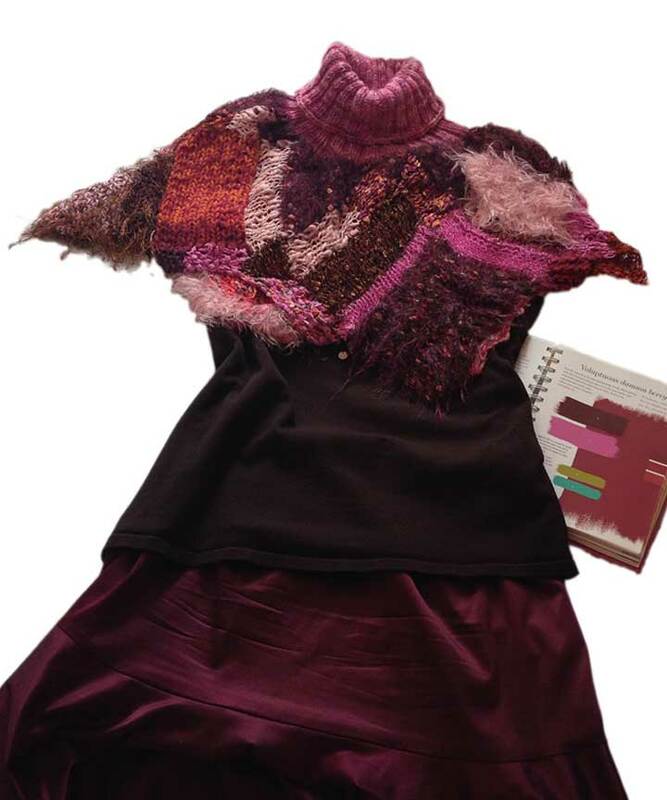 Hand-knitted capelet, combining bordeaux shades with both light and bright pinks. Also note the difference made by adding multiple new textures to this outfit. Layering also makes it more versatile. Notice how with each additional step, I’m actually creating a new look? And all based around the same skirt, and all done with things I already have! Step 5: Acc-ent-uate the palette! 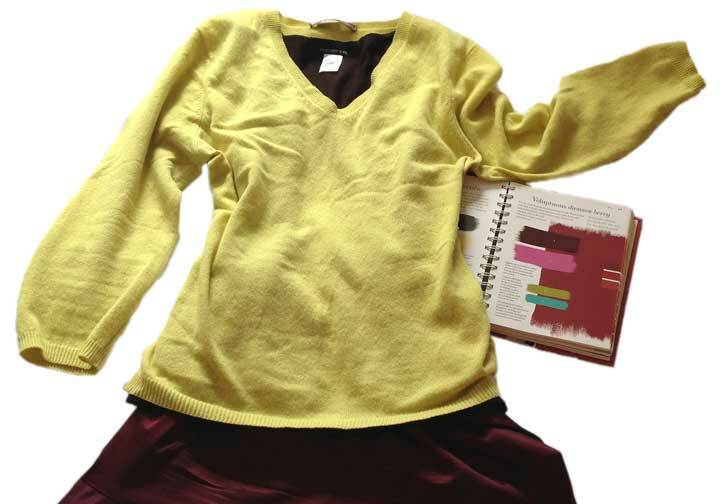 With the addition of the chartreuse cashmere pullover, this outfit suddenly feels totally different. Okay, I’m not sure this particular sweater works wonderfully with the style of the skirt, but the point is to start to visualize new color combinations, right? Step 6: Add another accent color, this time with accessories, that is, if I can find anything in my closet that’s reasonably close to turquoise. How about this green bag? It’s kind of in the same color family. I think. Ooh, and this turquoise scarf! Step 7: Add finishing touches. I’m going to put a favorite sweater-jacket in a deep rose-red over this outfit and see what happens! Step 7: Finish with a jacket! To my eye, at least, this ensemble suddenly looks much more cohesive. Again, the color of my jacket doesn’t exactly match anything in the palette, but it works. And the felted wool adds another textural surprise! Tip: Looking at this last photo makes me realize that it’s a great example of the use of complementary colors, in this case, red and green (and various shades thereof). Remember my color theory crash course? Complementary colors are opposite each other on the color wheel—the origin of many a fine color palette. Step 7, Part Deux: The Big Scarf Switch! Changing to this subtly-variegated scarf makes a crucial difference with all these solid colors. And for me, considering all the different textures I now have in the outfit, this combination works the best, color-wise; it’s just shades of red and shades of green. Simple! Looking at these photos again now, it really still amazes me that I could, in a matter of minutes (less if I hadn’t been taking these photos! 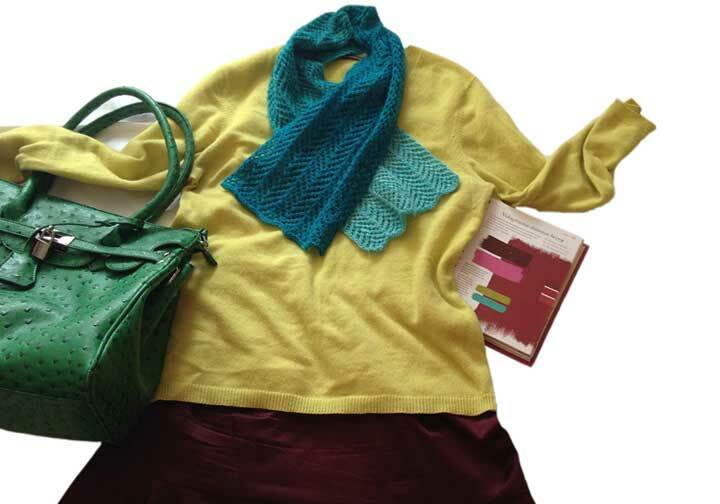 ), pull together an interesting outfit in a color combination I hadn’t thought to try before now. Quelle surprise, indeed! Find a color palette that speaks to you, then take it into your closet. I’m betting you’ll be surprised by what you find! I’d love to know what happens when you try this! If you want to get started right now (you know you do), browse palettes on ColourLovers. 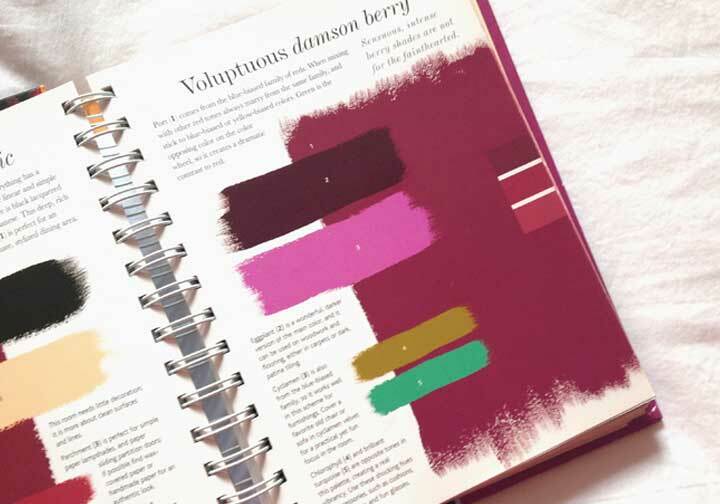 The link will take you to my page there, but you can search through the whole site; for example, when I searched for “bordeaux”, these are the palettes that came up. Categories: Color Palettes, Inspiration!, Lindy Reads, Wardrobe Creation | Tags: closet color palette, color palette, color palette book, color palette in wardrobe, color theory, color wheel, colormusing on ColourLovers, ColourLovers, complementary color, creating outfit based on color palette, The Color Scheme Bible | Permalink.